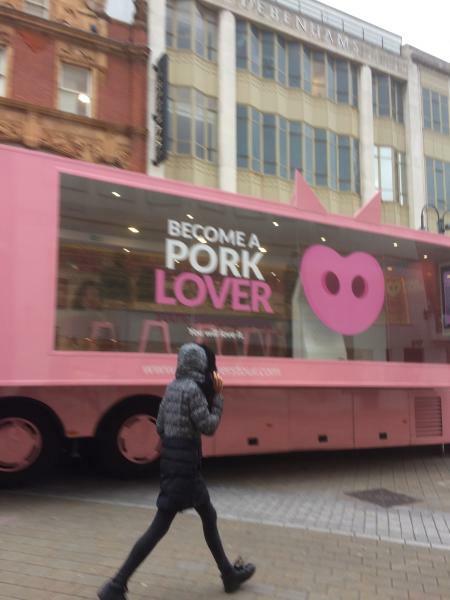 Home > News > Have you seen this pink (Brussels-funded) pork bus? The slightly odd vision in pink has been witnessed in Edinburgh, Sheffield and Leeds so far. The bus carries the slogan: “Pork lovers – 100 per cent European pork”. “Enjoy, it’s from Europe,” it adds (a subtle message to the UK?). The 'Pork Lovers Tour' originates from Spain, currently the fastest growing of the major EU pork nations and clearly with an eye on expanding its market reach. Ironically, as we seek to untangle ourselves from the EU, the whole venture is funded by Brussels in a bid to promote ‘pork white meat’. It is the initiative of Spanish pork industry body Interporc, which describes itself as the ‘most important Trade Organisation of the meat sector by volume of pork production in Spain’. The bus was spotted in Leeds this week by none other than Julia Lister, wife of the NPA’s chairman. She took some pictures, and, according to Richard, reported that the citizens of Leeds weren’t exactly falling over themselves to get on it. “She couldn’t quite believe what she was seeing,” said Richard. “And the fact that is funded from Brussels is certainly interesting – are they trying to get their retaliation in first? The Pork Lovers website gives a little more insight. 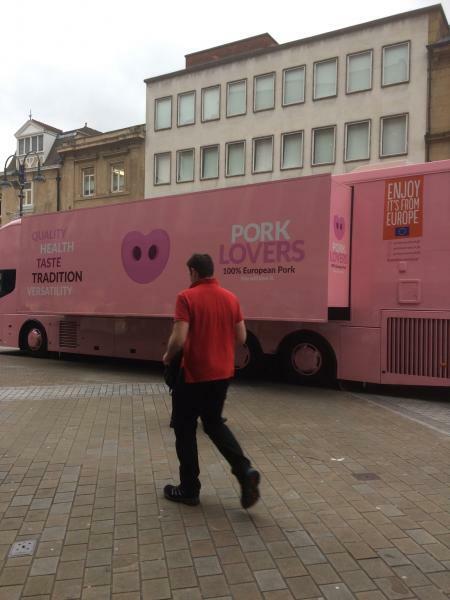 “It’s a Road Show that will visit strategic places in the UK and Spain and that we have organised, financed by the European Union, with the objective of raising awareness of pork white meat," it explained. Further searches on social media also reveal that the bus has attracted the unwanted attentions of vegan protestors during its travels. AHDB’s latest marketing campaign for British pork, focusing on pork medallions as tasty, convenient midweek meal option, and an alternative to chicken, is currently featuring on our television screens.